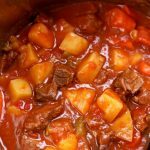 A super easy recipe for beef stew that doesn’t sacrifice flavor. This stew is comfort in a bowl! Cut your meat into bite-size pieces, discarding excess fat. Sometimes I like to do this when the meat is partially frozen. It cuts so much easier. Turn your Instant Pot to the saute setting. When the display says HOT add in the olive oil and swirl it around. Add in the meat in one layer and let it brown for 5 minutes on one side. Then 5 minutes on the other side. While the meat is browning prepare the vegetables. Peel the potatoes and cut them into chunks. I made them a bit bigger than the size of the meat. Dice the onion. Cut your celery into half inch pieces. Peel the carrots and cut them into half inch pieces on a diagonal. Once the meat is done browning pour in the beef broth. Scrape up all the browned bits on the bottom of the pot. Stir in the salt, sugar and worcestershire sauce. Add in all the vegetables on top of the meat. Pour in the can of crushed tomatoes. Don’t stir. Cover the pot and secure the lid. Make sure valve is set to sealing. Push the meat/stew button on your Instant Pot. Adjust the time to 30 minutes on high pressure. If your pot doesn’t have a meat/stew button just set the manual/pressure cook button to 30 minutes on high pressure. Let the pressure release naturally for at least 10 minutes and if you have more time you can do a full natural pressure release. Remove the lid. If you want to thicken the stew stir together 1 Tbsp of cornstarch with 1 Tbsp of cold water in a small bowl. Then stir the cornstarch slurry into the pot. I turned my pot to the saute setting and stirred in the slurry until it thickened up. It took less than a minute. Ladle the stew into bowls and serve. I served my stew with cornbread. You can easily double this recipe. Double all the ingredients but keep the cooking time the same.